1 God, after He spoke long ago to the fathers in the prophets in many portions and in many ways, 2 in these last days has spoken to us in His Son, whom He appointed heir of all things, through whom also He made the world. 3 And He is the radiance of His glory and the exact representation of His nature, and upholds all things by the word of His power. When He had made purification of sins, He sat down at the right hand of the Majesty on high, 4 having become as much better than the angels, as He has inherited a more excellent name than they. 5 For to which of the angels did He ever say, “You are My Son, Today I have begotten You”? And again, “I will be a Father to Him And He shall be a Son to Me”? 6 And when He again brings the firstborn into the world, He says, “And let all the angels of God worship Him.” 7 And of the angels He says, “Who makes His angels winds, And His ministers a flame of fire.” 8 But of the Son He says, “Your throne, O God, is forever and ever, And the righteous scepter is the scepter of His kingdom. 9 “You have loved righteousness and hated lawlessness; Therefore God, Your God, has anointed You With the oil of gladness above Your companions.” 10 And, “You, Lord, in the beginning laid the foundation of the earth, And the heavens are the works of Your hands; 11 They will perish, but You remain; And they all will become old like a garment, 12 And like a mantle You will roll them up; Like a garment they will also be changed. But You are the same, And Your years will not come to an end.” 13 But to which of the angels has He ever said, “Sit at My right hand, Until I make Your enemies A footstool For Your feet”? 14 Are they not all ministering spirits, sent out to render service for the sake of those who will inherit salvation? 1 For this reason we must pay much closer attention to what we have heard, so that we do not drift away from it. 2 For if the word spoken through angels proved unalterable, and every transgression and disobedience received a just penalty, 3 how will we escape if we neglect so great a salvation? After it was at the first spoken through the Lord, it was confirmed to us by those who heard, 4 God also testifying with them, both by signs and wonders and by various miracles and by gifts of the Holy Spirit according to His own will. Heavenly Father, thank You for Your Son, our Lord and Savior, Jesus Christ. Through Him You created the world. Through Him You reconciled mankind to Yourself. Through Him You will one day reclaim the world and all that is in it. Praise the Lord, Jesus Christ, for it is in His name that we pray. Amen. How is Jesus God’s ultimate revelation, the living embodiment of His Word, superior to all other messengers? 4 having become as much better than the angels, as He has inherited a more excellent name than they. 5 For to which of the angels did He ever say, “You are My Son, Today I have begotten You”? And again, “I will be a Father to Him And He shall be a Son to Me”? 6 And when He again brings the firstborn into the world, He says, “And let all the angels of God worship Him.” 7 And of the angels He says, “Who makes His angels winds, And His ministers a flame of fire.” 8 But of the Son He says, “Your throne, O God, is forever and ever, And the righteous scepter is the scepter of His kingdom. 9 “You have loved righteousness and hated lawlessness; Therefore God, Your God, has anointed You With the oil of gladness above Your companions.” 10 And, “You, Lord, in the beginning laid the foundation of the earth, And the heavens are the works of Your hands; 11 They will perish, but You remain; And they all will become old like a garment, 12 And like a mantle You will roll them up; Like a garment they will also be changed. But You are the same, And Your years will not come to an end.” 13 But to which of the angels has He ever said, “Sit at My right hand, Until I make Your enemies A footstool For Your feet”? 14 Are they not all ministering spirits, sent out to render service for the sake of those who will inherit salvation? Definition: A messenger, envoy, one who is sent, an Angel, a messenger from God. 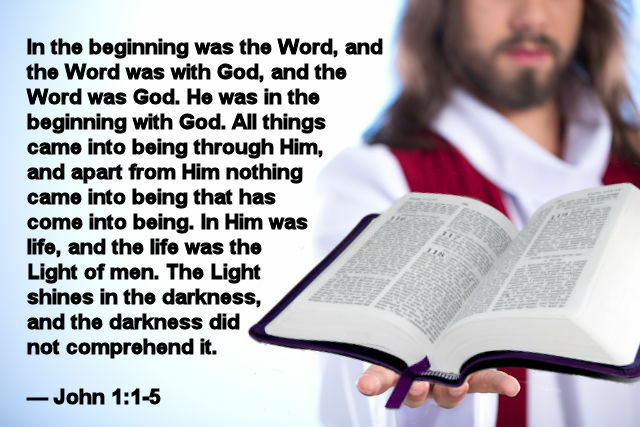 1 In the beginning was the Word, and the Word was with God, and the Word was God. 2 He was in the beginning with God. 3 All things came into being through Him, and apart from Him nothing came into being that has come into being. 4 In Him was life, and the life was the Light of men. 6 Jesus said* to him, “I am the way, and the truth, and the life; no one comes to the Father but through Me. 1 For this reason we must pay much closer attention to what we have heard, so that we do not drift away from it. 2 For if the word spoken through angels proved unalterable, and every transgression and disobedience received a just penalty, 3 how will we escape if we neglect so great a salvation? Heavenly Father, we praise You for Your Son Jesus. He is the living embodiment of Your Word. You and He are One. Far superior to the prophets and to the angels, Jesus is the message and the method of salvation. He is Lord and Savior and every knee shall bow and every tongue confess. Thank You for His precious gift of salvation, which can be found in no other. It is in Jesus’ name that we pray. Amen. “Jesus: God’s Ultimate Revelation” is part 1 of a 10-part study on the Book of Hebrews. You may view any of the following parts by clicking one of the links below.